Situated 25 km north of the Kosi Bay border and about 100 km south of Maputo, lies Ponta Mamoli, an undeveloped pristine coastline, practically untouched by mankind with some of the world's finest dive and fishing sites. A huge sea-facing timber deck surrounds the pool. 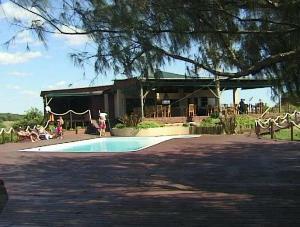 It is partially shaded with deck chairs and umbrellas as well as bar service and fresh water showers. Wine and dine with a wonderful view over the pool and Ponta Mamoli bay while enjoying stunning sunrises and sunsets. The 15 luxury timber chalets, which are built in the dunes on raised timber decks, are accessed by more than 700 metres of walkways. The chalets are all private, sea facing, with covered verandas and deck chairs only meters off the sea's high tide. 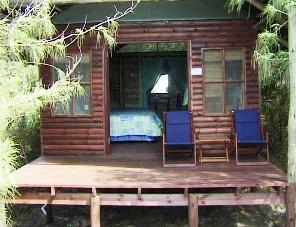 Each chalet offers 2 three-quarter beds with en-suite facilities. The resort boasts an authorized PADI Centre for scuba diving and snorkeling. Here you can swim with dolphins, spot whales, fish the surf and deep-sea or enjoy the many other water sport activities on offer.